One size, but can be expanded easily. 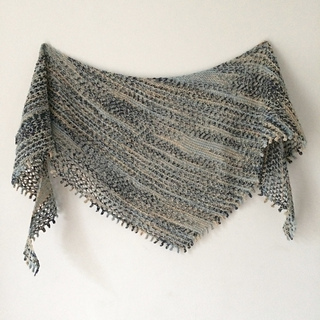 I always wanted a shawl that was free form with yarn overs to give it a worn out and withered look, but I always had some difficulty conceiving and writing such a pattern. I was able to solve the problem with a skein of Merilon Sock by Black Trillium Fibres. Starting with a few stitches, increases and decreases form the body while the color of the yarn determines when to make easy yarn overs, all while being surrounded by a nice picot edging and bind off. 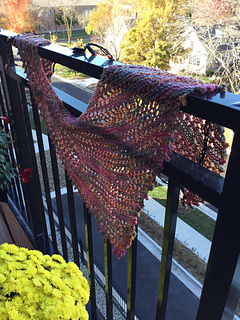 As you knit mindlessly, you will be amazed at how lace-like the shawl will appear, especially when similar colors pool together. A single skein of sock yarn is all you need for a wearable kerchief, but you can always use more for a larger wrap to snuggle in, and ANY space dyed yarn can work. About 26 sts per 4”. Since the project can be knit on any yarn, gauge is not critical. Sample shown measured about 40’ in wingspan and 23” from edge to deepest point before blocking.